Lancashire County Council has become the 50th local authority to agree to lobby Government to sign up to the Financial Transaction Tax. The motion was proposed at the County’s Full Council meeting on 15th May by Gina Dowding, Lancashire’s Green County Councillor representing Lancaster Central and also a European elections candidate. Lancaster City Council was one of the first to pass such a motion in 2012, and Preston Council recently followed suit. 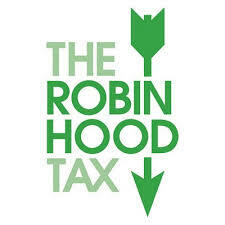 The Robin Hood Tax – or Financial Transaction Tax is a tax on all financial exchanges, including shares, bonds and derivatives. Even at the rate of 0.05%, the tax could raise up to £250bn per year globally and up to £20bn per year nationally. County Councillor Gina Dowding said “The money raised could be used to provide the vital council funding for services that are being decimated by government cuts. “A Robin Hood Tax would ensure that the number of high risk financial transactions, the gambling which helped to trigger the financial crisis, would be curtailed. By curbing some of the worst financial sector excesses, a Robin Hood tax would help to rebalance the economy. With the local and European elections just days away, the campaign is in full swing. Out on the doorsteps of Manchester people are telling us that they’re fed up with politics. Politicians don’t understand their lives and their concerns. They see them on the telly bickering with each other, trying to score points and bring each other down. They hear a lot about what each party is against. But not much about what they’re for. Over in America, Barack Obama won his election with a buzz of political activism and an upbeat message of ‘HOPE’. So where is the hope in our elections? This campaign has been dominated by UKIP and their negative politics. We all know that UKIP is against the EU and against immigration. They’ve invested huge amounts of money in billboards to tell us that. But what exactly are they for? They tore up their old manifesto and don’t seem to have any policies. Yet they are gathering support by exploiting people’s fears. You can understand it. We’ve been pushed through a punishing six years of spending freezes, then spending cuts. In times of uncertainty people look for simple answers to their worries. Will I keep my job? Will I keep my home? Will I be able to feed my family? People need to know that they can hope for a certain future. They need a confident, bold and positive vision that they can believe in. Earlier this week we launched the North West Green Party’s campaign for the local and European elections. Like you, we want a better world for ourselves and for our children. It’s outrageous that the 5 richest households in the UK have the same total wealth as the poorest 12 million people in our country. Inequality is not inevitable, but it takes a bold political party to make the case for redistributing wealth. The Greens have been brave enough to take on the political establishment on this. We have backed the Robin Hood Tax that will take a small percentage from the banking industry across Europe, and enable us to redistribute that money back to the people. £3.5 billion in profits for the big 5 energy companies while thousands are faced with a choice of “heat or eat” every winter is not inevitable. A scheme implemented by Greens on just one council in Yorkshire now saves households nearly £4 million a year off their bills. Our energy priority is to lower our energy consumption to save householders money and to reduce total carbon dioxide emissions. But we are also the party who stands up to the powerful fossil fuel industry and says “we will oppose fracking”. Unfortunately the parties with red, yellow, blue and purple rosettes all back the frackers. Politics is a serious business. You elect someone and trust them to spend your money and make the best decisions. When the government launched the High Speed 2 rail project the Greens looked carefully at the proposal, the business case and the environmental claims. They just didn’t stack up. We were told that we were wrong. UKIP even went so far as to include three High Speed Rail lines in its 2010 manifesto. Now, as more people are coming out against HS2 and voters realise that it’s going to cost every British household £1,500, there is a growing realisation that it may do very little to improve travel for the many. The benefits will be limited to business people when what we desperately need is more affordable local transport. What happens at the ballot box later this month is not just about electing councillors and MEPs. It’s about sending a strong message to our current government ahead of next summer’s general election. If the only story is about UKIP and fear, then that sets the debate and the agenda for the country. The Greens want to change the story. In the last European elections in the North West we were just 0.3% short of gaining an MEP. We think May 22nd really can offer Britain some hope, not just fear. 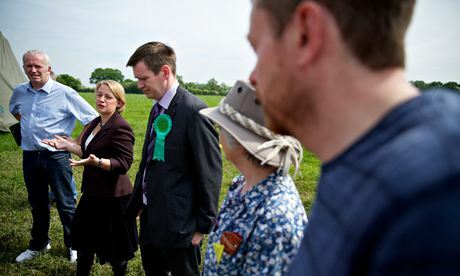 Green party leader Natalie Bennett and MEP candidate for north-west Peter Cranie, on a visit to an anti-fracking camp at Upton in Chester. The Green party, hoping to triple its number of MEPs to six and add 10% to its 140 local councillors in Thursday’s elections, is direct about its radical pitch to voters. “We need to entirely reshape our society so it works for the common good, not just the interests of the 1%, and we need to do this using just one planet,” says Bennett. Like all parties in the late stages of a campaign, they are focussed on ensuring their supporters vote, and the first stop is an anti-fracking camp in a field at Upton, near Chester. Amid the tents, dogs and a piano on a pallet, a friendly reception greets Bennett and college lecturer Peter Cranie, the Greens’ lead MEP candidate for the north-west of England. He lost to the BNP’s Nick Griffin by 0.3% in the last European elections and the morning after also lost his job. “It was the worst 24 hours of my life,” he says. Nearby in Liverpool, Green party activists prepare for canvassing with lunch at the Green Leaves veggie and vegan cafe on Lark Lane. Tom Crone, the Green council candidate for St Michael’s ward by Sefton Park, says he is anticipating a complete Lib Dem collapse in the city. Lib Dems ran the council until 2010 with 46 of 90 seats, but could be left with just a handful after Thursday. “Liverpool was one of the biggest hit by council spending cuts,” Crone says. “We could become the official opposition,” he adds, though the council will remain overwhelmingly Labour. But there are also knock-backs. One lady complains about an unresolved bin problem, while another says: “I don’t really know much about you.” The firmest rebuff comes from a retired man, who declines to give a reason just as firmly. “Immigration always comes up at some point,” says Crone. While Green window posters are most common, Ukip banners can also be seen. Nationally, the pro-Europe Greens back a referendum on EU membership. “We trust the voters,” says Bennett. She argues concerns about immigration stem from failed employment, housing and health policies, not the arrival of migrants. YouGov’s Wells praises the Green’s ability to concentrate their vote. “The greens have been very good at targeting support,” he says. 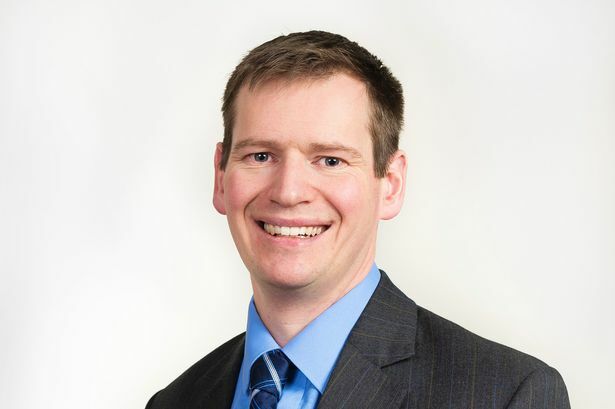 “In the last local elections Ukip came second in the vote but didn’t get that many councillors: the greens are the complete opposite, throwing everything at certain places and doing well.” As with previous local and European elections, the Green’s vote share leaps from the tiny 1% or less support they typically get in general elections.